San Luis Obispo City Hall, Mission Prep, Old Mission School and numerous downtown businesses were placed in lockdown Monday as heavily armed officers chased an armed parolee. On Monday afternoon, San Luis Obispo County Sheriff’s deputies were searching for Cambria parolee Jason Michael Atkins, 36. 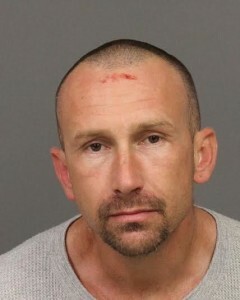 Deputies spotted Atkins as he was riding in a vehicle near Walnut and Peach streets in San Luis Obispo. Deputies tried to conduct a traffic stop, but Atkins exited the vehicle and fled on foot. The driver fled in the vehicle. A multi-agency manhunt for Atkins then began. A California Highway Patrol helicopter flew over downtown as deputies, San Luis Obispo police, Cal Fire personnel and a sheriff’s K9 searched for Atkins. City officials said City Hall was shut down because it was believed there was a gunman running around town. After searching for about an hour, officers found Atkins hiding in the garage of a home on Peach Street. Officers took him into custody without incident and booked him in San Luis Obispo County Jail. Atkins currently remains in jail with his bail set at $105,000, according to the sheriff’s office website. He is facing seven charges, including violation of parole, evading an officer and being a felon in possession of a firearm. In 2011, Atkins was the subject of a previous manhunt which followed an armed robbery in San Luis Obispo. Officers found him hiding behind a rock on Cerro San Luis. When they lock down city hall because a supposed gun man is on the loose… if I am a citizen walking around and I feel threatened or frightened, so I run to the doors of the city hall to get help, does that mean they won’t let me in, and will watch me get gunned down from the safety of the building? Depends, are you one of the Elite? Or just one of the Rabble? Unfortunately these days…..if you went running towards the building security would probably shoot you before the gun man could. I’m not smart enough to work for government, but maybe it’s a good idea to stop parolling this guy. How about a 2 armed manhunts and you’re out rule? Poor guy seems to have trouble finding good hiding spots. Crime is up 23% in California…don’t blame anyone but yourselves. Everyone that voted for Prop 47 should rethink their philosophy on crime and punishment. Yeah but it’s still down about 70% since the early 1990s. Get a grip. So a certain amount of backsliding regarding crime is okay with you? after someone you care about is a victim maybe you…. then can get a grip. “A multi-agency manhunt” consisting of “CHP helicopter flew over downtown as deputies, San Luis Obispo police, Cal Fire personnel and a sheriff’s K9” and the “lockdown” of “San Luis Obispo City Hall, Mission Prep, Old Mission School and numerous downtown businesses” was required to catch one guy? Amazing, isn’t it. A high crime day in SLO. I watched that copter circling for about an hour. Then drove down Chorro and saw a phalanx of cop cars parked there for the “manhunt.” And the TV girl doing her standup, so we knew it wasn’t too big a deal at that point. Sure wasn’t expecting something this trivial was the cause of all that conspicuous expenditure of our tax dollars. I guess if we had a real crime spree, we’d have to call the army or somesuch. Yes, it apparently was. Demand dictates need. The demand is these deranged tweaker wolf children of the welfare industry. The need is more cops. And no, I don’t want the aforementioned demand thinking they can get away with, or from, anything. Good job, LE. We’ll talk about the long doughnut breaks later. The cops ARE deranged wolf children of the welfare industry. They just get more welfare, and can afford high quality tweak.